See TALS Tackle Tubes in Action! 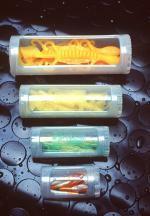 With TALS Tubes a twist is all it takes! No more fuss with lids, latches, hinges or end caps. Simply rotate the one end of the tube and a side window opens up providing easy access to the contents. 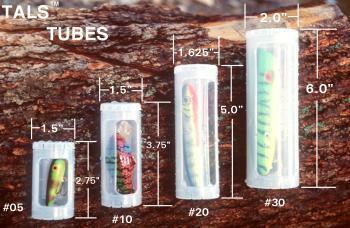 TALS, polypropylene and worm proof, tubes make it easy to identify, protect and organize your tackle. Continuous ventilation prevents rusty hooks and mildew build up and an internal latching mechanism prevents the window from jarring open. On the back of the tubes is a flat, rectangular area which prevents the tubes from rolling when set down and which also provides the attachment means to any loop material and/or Velcro® brand loop material. This hook and loop attachment provides easy arrangement and secure storage of the tubes inside the TALS packs and also on the Velcro® brand adhesive backed loop strips available below. The Velcro® brand loop strips below can be mounted on any hard flat surface such as the gunnels inside of boats & canoes, inside storage locker walls and under lids, on boat consoles, in kayaks, etc., adding a new dimension to storing and accessing your tackle. #35 Fly Tube can be utilized as a spinner rack! "I would like to thank you for The TALS System, I bought mine at the Harrisburg Sports show 2 years ago and have used it with much success in wading the Susquehanna River. I bought extra tubes so as the conditions change I just change my tubes, I keep my tubes filled and ready to go for the fishing season. I don't think I ever wrote a letter recommending a product but in this case I have been very pleased with the product and will continue to use mine a lot." 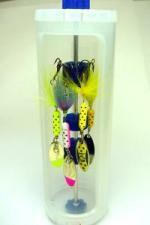 "Best idea I’ve seen so far for keeping lures separated and at hands reach. I’ve been using small containers and a fanny pack but this is so much better. You don’t have to worry about losing everything in the water. 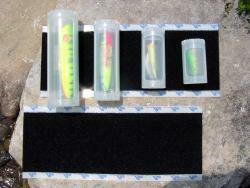 A must for those who wade fish or use float tubes."